Lucky 13 – The New York Rangers continue to find ways to get points, as they improved to 10-0-3 in their last 13 games with a 3-2 shootout win against the Buffalo Sabres on Monday night at HSBC Arena. It was the second shootout victory in as many days for the Blueshirts, who moved into a fifth-place tie with the Ottawa Senators in the Eastern Conference. More importantly, the Rangers now are just three points behind the New Jersey Devils, who lead the Atlantic Division and the Eastern Conference. Scott Gomez, who crossed the Hudson River last July to sign a free-agent deal with New York, may have brought some of the winning attitude that has oozed out of New Jersey since the mid-1990s. As long as Henrik Lundqvist continues to perform like he has during the past few weeks, there's no reason why the Rangers can't play their first postseason game of 2008 at Madison Square Garden. Lundqvist is 8-0-2 in his past 11 appearances and robbed Maxim Afinogenov on a breakaway in overtime Monday. Jarome's No. 1 – The Calgary Flames have a new all-time leading goal scorer, and it just so happens to be one of the game's most-respected players. Jarome Iginla – a superstar and an ambassador for this great game of ours – passed Theo Fleury on Monday night with his 365th goal as a member of the Flames during a 7-3 win against the St. Louis Blues. Iginla, 30, has spent 11 seasons in the NHL, all with the Flames. Monday's win put Calgary back in the driver's seat in the Northwest Division, albeit by the slimmest of margins. The Flames are one point ahead of the Minnesota Wild, while the Colorado Avalanche and Vancouver Canucks trail Iginla's club by only two. Calgary begins a three-game road trip Wednesday night against Alex Ovechkin and the Washington Capitals. Monday, though, was all about Iginla's tremendous accomplishment. Better Late Than Never – The Vancouver Canucks began a four-game road trip Monday night in search of a much-needed victory against the Los Angeles Kings. 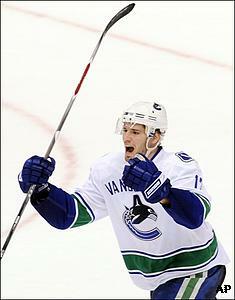 Vancouver Canucks' Ryan Kesler celebrates scoring the winning goal in overtime against the Los Angeles Kings. Ryan Kesler provided just that. Kesler erased a 1-0 deficit with 2:41 to play in regulation, and then won it 46 seconds into overtime as Vancouver pulled out a victory at Staples Center despite some terrific goaltending by Dan Cloutier, who finished with 38 saves. "We knew we were playing a solid game and throwing pucks on net," said Kesler, who now has a career-high 19 goals. "Cloutier was playing really well, and we just kept saying that if we got some traffic and pucks in front of the net that something would go in and that's kind of how it happened. The puck was just lying there, and I got my stick on it." Vancouver has won three in a row and remains very much alive in the Northwest Division race. While the Calgary Flames took sole possession of first place Monday night, the Canucks are only two points behind. They are just a point behind the Minnesota Wild for the No. 6 seed. The return of Brendan Morrison will help the playoff push. The Canucks' center was in the lineup Monday night after missing the past 38 games with a wrist injury. Morrison had appeared in 542 consecutive games – the longest active streak in the League – but his last game prior to Monday night took place back on Dec. 10. Morrison admitted he was suffering from some pre-game jitters. He played a little more than eight minutes and had two shots on goal.